Welcome to Monitor, the data acquisition and control newsletter. You can also download Monitor as a pdf file from https://www.windmill.co.uk/monitor/monitor220.pdf. * Your Questions Answered: Is an external power supply needed when measuring strain? Your Questions Answered: Is an external power supply needed when measuring strain? I am very interested in your 751-SG system (for measuring strain), and was wondering if you could clarify a few questions for me. Is there an excitation voltage provided by either the 751 / 594 unit, or does it require an external power supply? For strain gauges you need an external excitation voltage that can supply sufficient current to keep all the bridge circuits energised. The auxiliary channel of the 751 unit monitors this excitation voltage. The Windmill software automatically reads the excitation voltage and performs the bridge calculation to produce a reading in microstrain. You can set a zero reference level and monitor changes relative to that level. The screen shots here are taken with Excel 10: the method works for just about all versions. There are a couple of ways to highlight the highest value in each row using Conditional Formatting. Cell Value Is and equal to. Type the maximum formula into the condition box - eg "=MAX(D7:G7)"
It's tedious to repeat this for every row though. The first solution I used was to insert a new column in which each cell showed the maximum value of its row, using the MAX formula. In our example in the image above, in Cell H you'd type =MAX(D7:G7). Copy this down to the bottom of the data table. Now select your data range, including the maximum value column. This time, in the Conditional Formatting box enter =$H7 (where $H is the column containing the maximum values). You can now hide the maximum value column. Where D7 is the first value in the range. This works because Conditional Formatting uses relative references. If you click on another cell in the range, say E10, and select Conditional Formatting, you will see that the formula is "=E10=MAX($D10:$G10)". It is checking whether E10 is the maximum value in the row D10 to G10. Using this method you can dispense with the extra column - a more elegant solution. Conditional formatting lets you highlight just about any condition, you just need a little imagination as to how to achieve it. More tips on condition formatting with Excel were given in issue 83 of Monitor, archived at https://www.windmill.co.uk/monitor83.html. If you have a question about using spreadsheets for data acquisition and analysis - email [email protected]. Mixing graphene - a material made of single-atom-thick layers of carbon - with homemade "Silly Putty" produces a sensor so sensitive that it can detect the tiny footsteps of spiders, according to new research. Researchers at the Georgia Institute of Technology have developed a system that teaches people Morse code within four hours using a series of vibrations felt near the ear. Participants wearing Google Glass learned it without paying attention to the signals - they played games while feeling the taps and hearing the corresponding letters. After those few hours, they were 94 percent accurate keying a sentence that included every letter of the alphabet and 98 percent accurate writing codes for every letter. Scientists succeeded in getting their first continuous look at the boom-bust cycles that drive polar plankton communities by using a space-based sensor capable of seeing through darkness, clouds and fog. As a thank you for subscribing we offer you the ComDebug data logging and Com port trouble-shooting software. Log data over RS232, RS422, RS485 or Modbus. 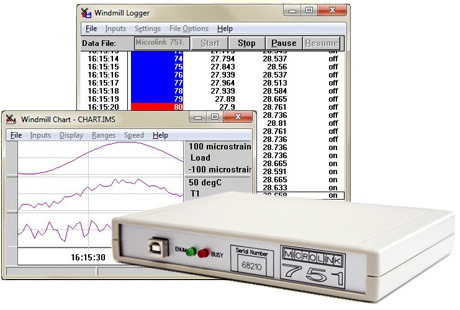 Also included is a month's trial of the Windmill 7 logging, charting and control programs.